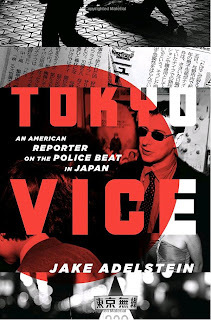 Jake Adelstein, author of Tokyo Vice, has popped up in a couple of my favorite places to get news. His life story appeals to me as being both very entertaining and inspirational. He picked up and moved to Japan, living for three years in a Buddhist temple, then working as an English teacher and part time as a Swedish massage therapist, then eventually becoming a reporter for the Yomiuri Shimbun, credited as having the largest circulation in the world. At Yomiuri he worked as a crime reporter and his book reveals the depth of his knowledge on the Yakuza, or Japanese mafia. His little interview on the Daily Show was my introduction to his work. The interview is a bit offbeat and has a few amusing bits. My favorite quote is "[Liver Damage] is the number one cause of death for yakuza.... other than being shot or beheaded." One of my favorite newsy podcasts is NPR's Planet Money. Here Adelstein "talks about how the business of the yakuza groups has changed over time and how tighter government restrictions have pushed the Japanese mob into more "traditional" investments." You can listen to or download the podcast here. My favorite part of this one is the story of how the Yakuza hired actors to pose as Japanese bank execs in order to trick Lehman Brothers into loaning a front company $300 million. It's pretty golden. Fresh Air has another longer program with him as well as an excerpt from his book here. And finally, Jake edits the blog www.japansubculture.com. A notable recent post here is entitled "Eating sushi off a naked girl: yay or yuck?" I'll be putting his book on my Christmas list.